Sawngthaew rides can be "more intimate" than bus rides and a great way to interact with locals, an expat guesthouse owner in Vang Vieng told me. He was recounting a ride he took to Vientiane years ago, where he witnessed a gaggle of village women get taken for their gold jewelry by a group of bean-game con men. "Of course, it could just be boring and uncomfortable," he added. Our sawngthaew ride from Vang Vieng was certainly intimate – perhaps slightly boring and uncomfortable – but no bean-game con men got on board. A sawngthaew is essentially a covered, open-air pick-up truck outfitted with two padded benches. In the back of ours, over the course of the four-hour journey, various characters got on and off: a monk with a slide-top cellular phone and a pack of menthol cigarettes; a farang in camouflage cargo shorts and his Thai girlfriend who wore hot pants and a pair of oversized sunglasses; an older woman with a baby and a blue plastic bag of tamarinds; a young man with bleached hair and a blingy bracelet; three schoolgirls in matching black-and-white uniforms; a stern-looking boy in green military fatigues; a middle-aged man who wore a dusty blue-and-white Adidas track jacket, a pair of knockoff Oakley's, and a white-patterned ball cap with an embossed dollar sign and a faux Major League Baseball emblem. At one point there were 16 people in the back, two in the front and the driver. About an hour into the ride I opted for some sun and some breeze in my face, and ended up clinging to an iron bar on the roof of the truck for about two hours, unable to reclaim my seat. The red and yellow of communist hammer-and-sickle flags were ubiquitous along the road as we passed, and were passed by, convoys of green tarp-covered Chinese transport trucks. We had to change vehicles outside of Vientiane when the sawngthaew broke down, and we rode in a tuk-tuk the rest of the way into the city. 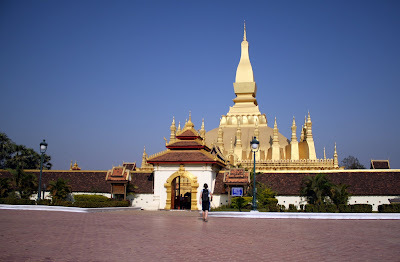 Vientiane sits just north across the Mekong River from Nhong Kai, Thailand, and its riverfront strip is a lively mix of French restaurants, business buildings and reggae bars. At first sight the city is hardly picturesque, but we soon found it had a character all its own, its people friendly and welcoming, and its streets pleasantly navigable. We settled into a guesthouse in a quiet neighborhood a little bit out from the river near the National Stadium. The guesthouse had large rooms with vaulted ceilings and walls painted institutional green, and the beds were little more than elevated planks with tired mattresses, but we managed to sleep nonetheless. The next day we headed out for some sight seeing. 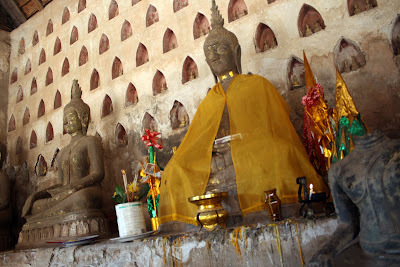 We first visited the 458-year-old Sisaket Wat near the city's center. 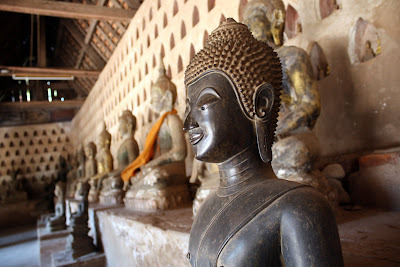 The wat has a museum that houses Laos' largest collection of Buddha statues – 10, 136, to be exact. Some of the statues have been unearthed and rescued from construction sites and road projects, and many of them are damaged and burned relics from the Indochina War. The museum's curator, Mr. Soy, welcomed us to the wat, tying colored-thread bracelets to our wrists and wishing us good luck, good health and happy lives. Mr. Soy told us about a man who visits the museum every day and cares for a particular, non-descript Buddha statue, which he believes is the Buddha. 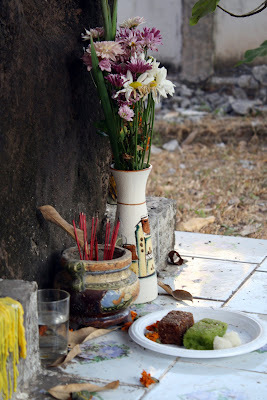 The man burns incense for the Buddha, keeps it covered with an orange cloth and leaves it little presents. Mr. Soy didn't know why the man felt that this Buddha was the one, but he said the man has been coming to the museum for years. Later in the day, on our way to the massive memorial golden stupa north of downtown, we stopped off for an ice cream at a small roadside restaurant and ended up playing Chinese poker with a group of young locals, a couple of whom spoke quite good English, which is a rarity in Laos. At the stupa, bands of Asian and Western tourists, led on by the monotonous drone of their tour guides' rambling, milled about the main square, snapping obligatory photos before dribbling back into their party-theme painted VIP buses on the way to the next cultural highlight – a phenomenon I've come to call "checklist tourism." That night we found the Anou Cabaret, where a live band complimented stiff and tentative table service while singers crooned and the lead vocalist belted country western tunes in broken English. An informal ballroom dancing contest – waltz, salsa, tango, samba, fox trot – concluded with award certificates for the winners, and afterward simple improvised line dancing opened up to the public. Aware that we were the only farangs in the joint, we stayed seated. It was in Vientiane that I began to theorize that there must be a massive industrial bakery somewhere deep in the jungle in Laos, churning out these little baguettes that have been on almost every menu we've seen in the country thus far. I picture the bakery operating 24-hours a day, employing brigades of scooter-driving kids who shuttle the light chewy loaves around the country. 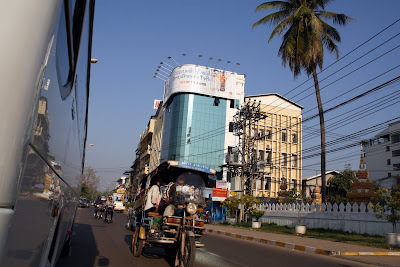 On our last day in the city, we spent six hours at the southern bus station waiting for our bus to Savannaket, a small crumbling colonial town halfway to Si Pan Don (4,000 Islands) in southern Laos. At a small restaurant near the bus station we ate a quick meal of fried chicken – more bones and gristle than meat – with a bowl of rice and some clear broth with watercress floating on the oily surface. The waitress, pretty and bitter, sulked the food to our table; a towel was draped over her shoulders and her hair – in the middle of a dye-job – was pinned above her neckline. On the television a Thai soap opera played, in which a victim haunted his killer, while a half-dozen patrons sat glued to the screen. Two lethargic fans oscillated on the wall above our table. At the station, I gave a small, shy boy a baseball I had been carrying since I left Denver, and we rolled the ball back and forth between us across the tiled floor of the terminal. My traveling companion, Jen, took out her green Frisbee and began tossing it to the locals. Soon, our little corner of the station was a pocket of gaming frivolity. A Thai boxing match played on the lone television, young men exchanging baht at the bout's conclusion. For dinner we ate cheese and, yes, baguette sandwiches, while dusk settled on the departing buses. My. Soy, the friendly and informative museum curator at the Sisaket Wat in Vientiane. 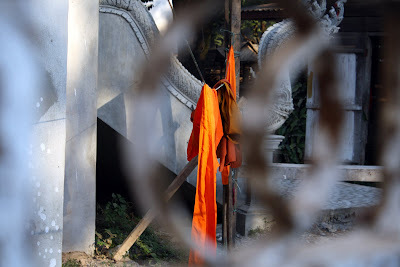 Monks' robes drying in the sun as seen through a fence at a small wat in Vientiane. Offerings at a wat in Vientiane. 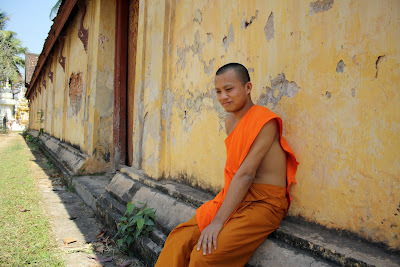 A shy monk at the Sisaket Wat in Vientiane allows me to take a picture, but is unwilling to look at the camera. The massive memorial golden stupa north of Vientiane's downtown. 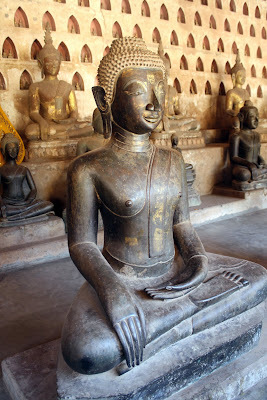 One of the 10,136 Buddha statues at the Sisaket Wat in Vientiane, Laos. The statues have been collected from all over Laos, and the wat's museum claims the largest collection of the statues in the whole country. 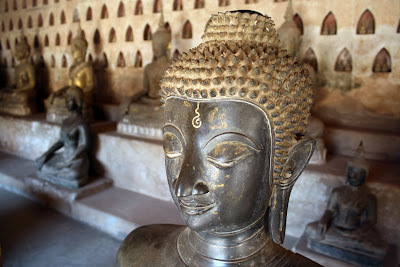 A decorated Buddha at the museum at the Sisaket Wat in Vientiane, Laos. A man who believes this statue is the Buddha came everyday to bring offerings and burn incense for the Buddha. 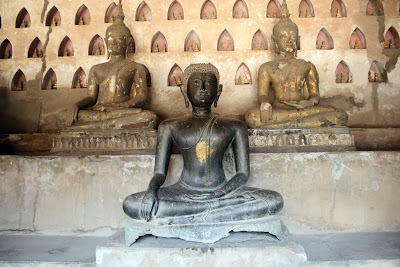 Buddhas at the Sisaket Wat in Vientiane, Laos. 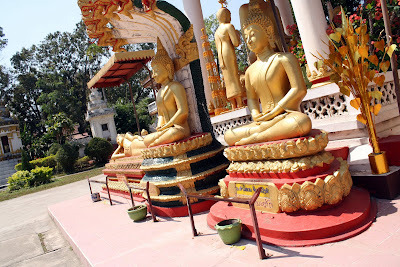 Golden Buddha statues at the Sisaket Wat in Vientiane, Laos. A guide at Lusi Cave stares wryly at the camera. There were few attractions around Vang Vieng that didn't have an attendant waiting to collect a few thousand kip for admission. 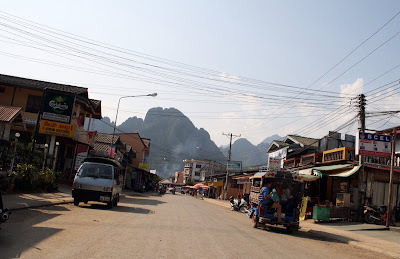 Vang Vieng – dusty, hot and dry – during the day. For the most part, if people weren't tubing on the river, they were hiding out in their hotel room or bungalow – or holed up in a Friends bar – recovering from the night before. It was common to see tubing-injured Westerners limping down the street. 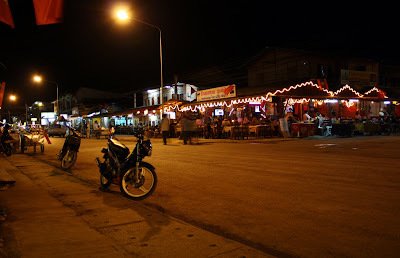 One of the main intersections in Vang Vieng, lit up at night by the glow of streetlights, fluorescent tubing and the glare of Friends on television sets. Inside the Lusi Cave, located a couple of kilometers south of Vang Vieng, under the karsts that overlook the Nam Song River. 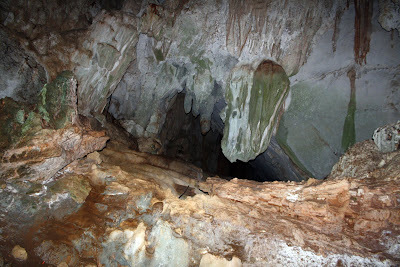 We walked for half an hour into the cave with just a flashlight and a local guide. At the end of the cave, which was hot and dry and cool and wet all at once, there was a large pool of water that we stood beside and turned off our flashlights to enjoy the utter darkness. Vang Vieng, Laos, located 400 miles south of Luang Prabang on the road to Vientiane, is a boisterous nook nestled along the banks of the meandering Nam Song River. Towering karsts overlook this fast-growing backpacker haunt, where Friends bars, banana pancake vendors and a vigorous tubing industry fuel the local economy. Our VIP bus (read: glorified Greyhound) crept down the thin wheedle of twisting mountain road between Luang Prabang and Vang Vieng, passing thatched villages clinging to crumbling red earth, bamboo and banana trees sprouting from the precarious ridgeline. Half-clothed children played along the side of the road, while squatting men with cigarette lips stared at the passing bus. The vegetated cliffs and hillsides were a brown-and-green patchwork of flattened, stalk-strewn earth, evidence of widely practiced slash-and-burn agriculture. Dissipated smoke obscured the choppy horizon. 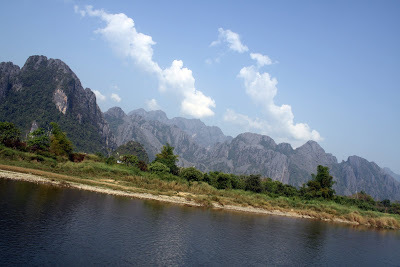 As we descended into the valley, the smoke from Vang Vieng's two concrete factories – the first of which is pictured on the Laos 5,000 kip note – was visible to the east of town. Sheer cliffs to the south dwarfed its few dusty streets and threatened shadows over the river's wide lazy bends. Vang Vieng's tubing operation used to be more communal, but it has since been consolidated into a kind of cartel, where tubes are rented out by only one place in town and the tuk-tuk ride upriver is included in the rental price. On the river, mop-haired, tanned and tattooed farang swing from ropes and zip lines, leap off of diving platforms, drink buckets of booze and avoid, for the most part, any serious paddling. There are injuries, as well. Rope swings break, zip lines snap, people land wrong in the water, and rocks exposed in the dry season cut and scrape reckless tubers' legs and arms. Dozens of people limp around town with bandages and splints. When once the common accident in Southeast Asia was motorcycle spills, now it is tubing in Vang Vieng. At night, along streets lined with eerie fluorescent lighting – like a border town in a Quentin Tarantino film – tubers and other farang gather cult-like to watch Friends, Family Guy and the occasional The Simpsons episode, the televisions' glare turning their blank faces skeletal under the bars' dim lighting. In most of the restaurants, festive tinsel hangs from walls and small fake Christmas trees still stand decorated. Between January and April, the Western, Chinese, Thai and Laos New Years are all celebrated, so decorations are kept up for at least four months. Away from town on the other side of the river, across the bamboo footbridge and along the cow-dung dotted riverbank, is a quaint cluster of thatched bungalows surrounded by a well-kept garden. 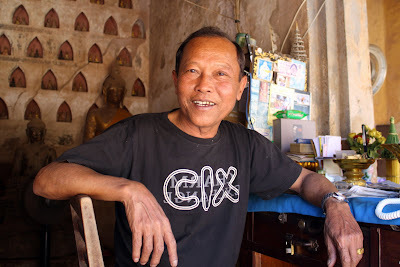 The guesthouse is run by man from Ireland, whose accent has been erased over time by stints in Australia, London, Thailand, and now eight years in Laos, and who asked not to be named. But for this posting I will call him Michael. "I've fallen out of love with Asia," Michael told me one afternoon while we were sitting in the shade under his elevated, dark-stained wood house. He has grown frustrated with the town's willingness to sell itself out to farang, and he has dealt with his fair share of local corruption. He is tired of his neighbor's burning rubbish piles near his property. He finds it difficult to find reliable labor, and he described his general attitude as "weariness." MIchael is even contemplating petitioning the local government to pass laws regulating loud music, which can be heard drifting across the river late into the night. "I'm all for Laos developing a good tourist industry, but this place seems to attract now a dumb sort of individual," he said. He fears the serene paradise he moved to eight years ago has been corrupted beyond repair. "The thing that really ruined this place was the electricity … you'd think (the locals) would've gone for refrigerators and fans, but no – it was karaoke machines." To make matters worse, he said, there is no "community culture" and no activism on behalf of the environment, so his efforts to petition the government are more than likely in vain. Also, he says doesn't want to stir up trouble. Michael has bags under his slate blue eyes, and a graying scrabble of dark brown hair. He is a consummate viewer of Fashion TV, a habit he described as "titillating yourself with horror," but he said it is the Thai soaps – "everybody slapping everybody" – that are corrupting Laos culture. 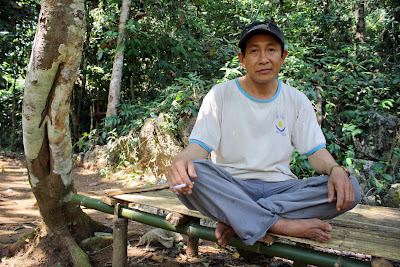 From his point of view, Vang Vieng was once an idyllic setting – "I used to be able to see blue sky" – that has been run over by development interests and a disregard for the environment. Vang Vieng is one of the most beautiful areas I've seen in Laos. There are caves to be explored, blue lagoons to drift in, and mountain biking is the preferred method of transportation. But this paradise of easy living has already developed a reputation among more subdued travelers, and for some this den of frivolity has seen its day. Vang Vieng is your place if you are young and on holiday from school with a taste for loud music and no real desire to immerse yourself in local culture. But if you fancy a taste of real Laos, Vang Vieng is more like, as Michael put it, "paradise already spoiled." 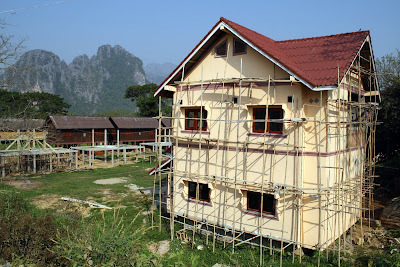 Vang Vieng is undergoing an explosion of development, with new guesthouses and bungalows going up all over town. Many of these places look to be catering to wealthier clientele, but with Vang Vieng's wild backpacker reputation preceding it, it may be hard to pull in top dollar travelers amid the tubers and Friends fanatics. 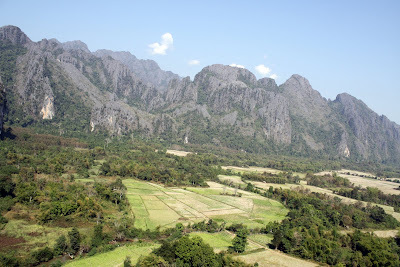 Karsts south of Vang Vieng, as seen from the top of a small hill, the top of which was reached via bamboo ladders rather than a dirt path. Boy in a field across the river from Vang Vieng on the way to Lusi Cave. 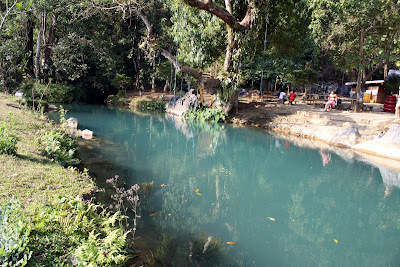 A swimming lagoon – which is owned collectively by a local village – half an hour south of Vang Vieng. 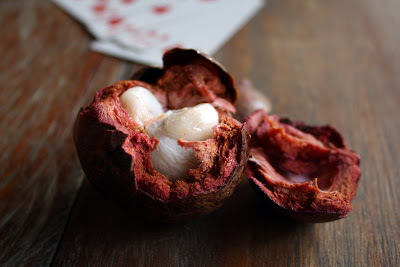 The mangostine: quite possibly the world's most delicious fruit. 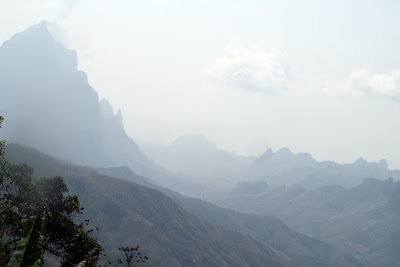 Jagged karsts thrust up from the lush, hazy hills of north central Laos on the way to Vang Vieng. 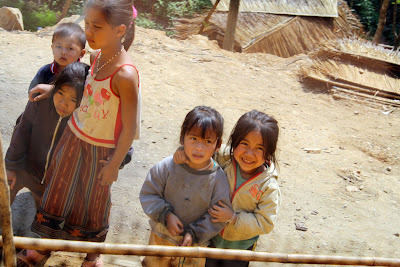 Village children stare at our tour bus on the way to Vang Vieng. Tiny, dust-caked villages – often little more than a couple of huts – populate the mountain road that climbs out of Luang Prabang and leaves the Mekong River far behind. 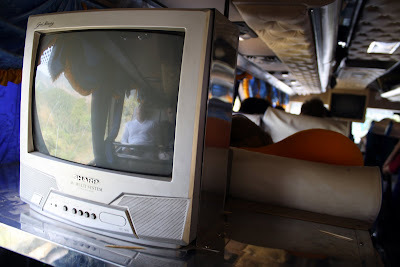 A sleeping traveler reflected in a television screen on the bus from Luang Prabang to Vang Vieng. 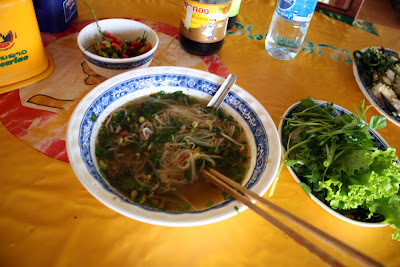 A buffet of simple chicken noodle soup, with fresh herb garnishes and plenty of chilis, provided with the "VIP" bus ticket from Luang Pabang to Vang Vieng. Same same, but different. 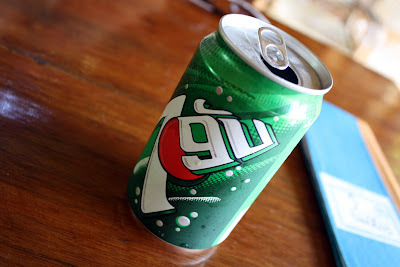 Many Western products are available in Laos, but often their packaging is changed to make them more accessible to local palates.